Football season, grilling out weather, holiday gatherings...fall is here! It's time to refresh the bar cart. 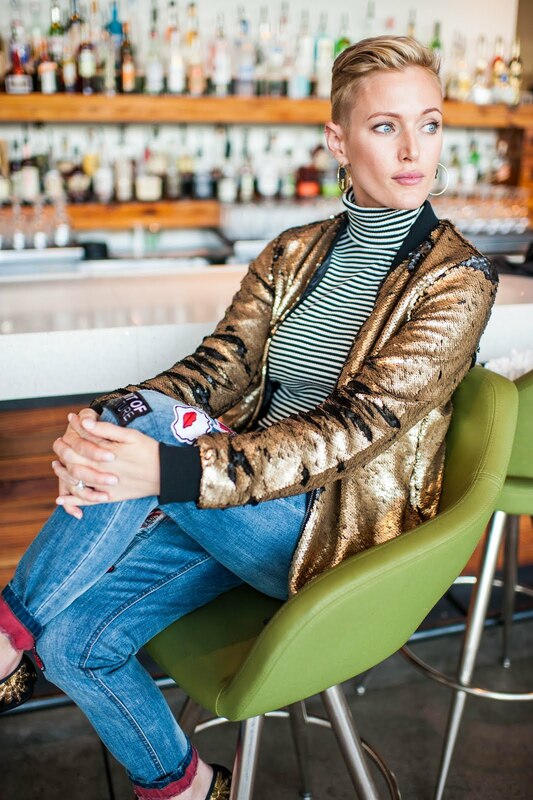 Read on for a few styling tips in my new bar cart styling series! Inspired by that beautiful golden hour when the sun is starting to set, I've gathered a few items with glints of gold and amber to help transition your home into the season of cozy sweaters and warm libations. Kick off your shoes and enjoy your art collection with a gin and tonic! Hendrix is my personal favorite. The painting hanging on the wall is titled "Green Thumb" and helps bring the outdoors in. It's a very meditative piece and especially nice after a long day. 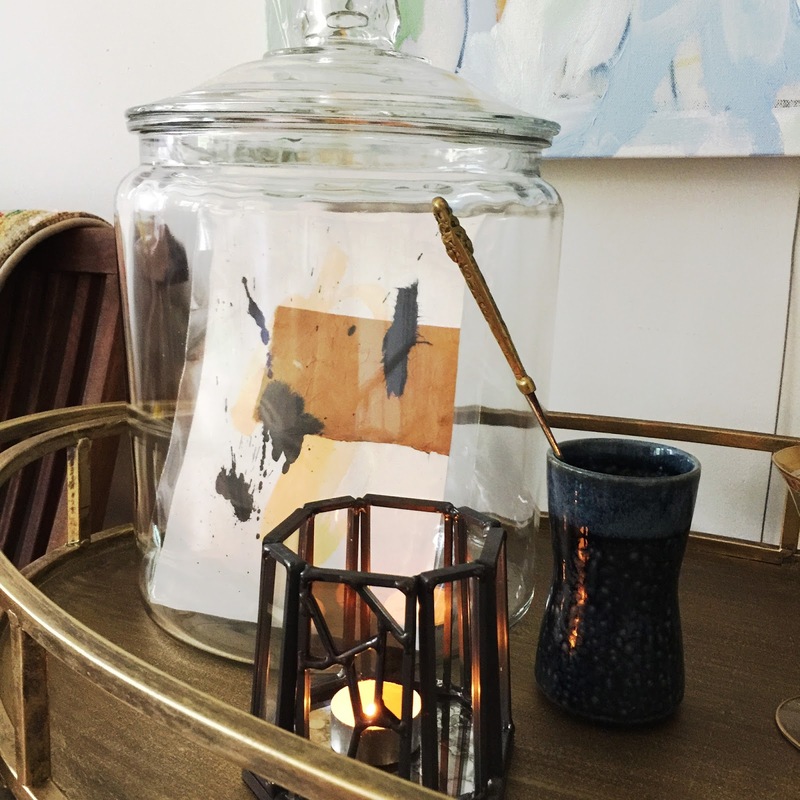 Keep your original paintings on paper on display while keeping them dry in a glass jar. You'll love getting to take in your art up close while mixing your beverage. Displaying art in unconventional ways truly does change how you experience it. A leather journal is perfect for jotting down new types of wine or recipes you want to try again! This one is refillable and can hold multiple notebooks. 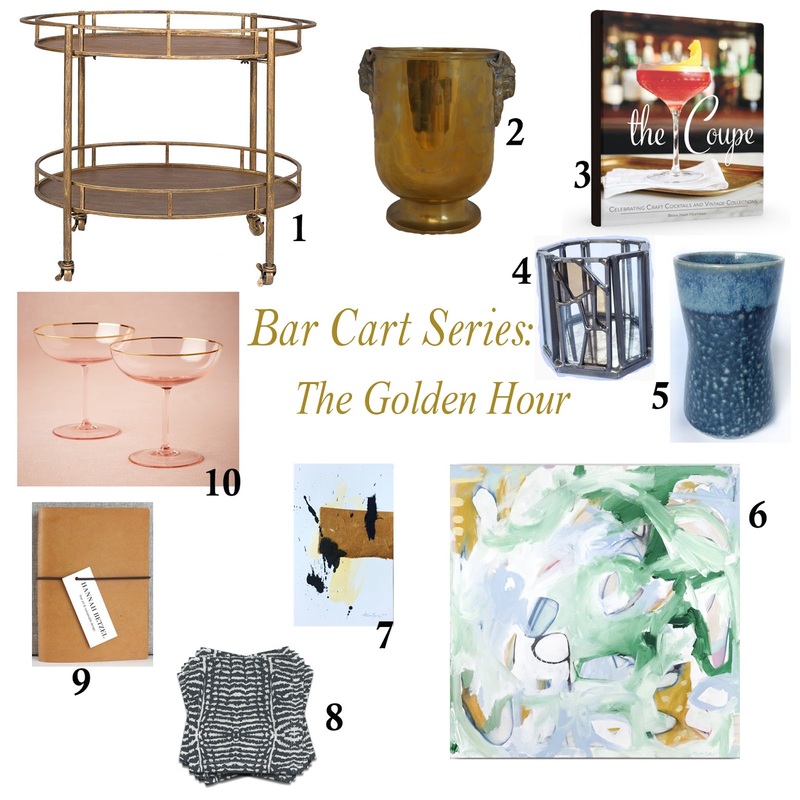 I've put together a list of things you might need for your own bar cart. You can find lists all over the internet with which types of alcohol should be on your cart, but I'm of the opinion that people simply ought to buy what they like to drink. No need to have one of every type of alcohol if you or your friends never drink it! This list will help you style your bar cart and have it looking fab in no time! Pick out pieces you truly love and it will bring you joy every time you walk by it. Add seating nearby and you may even find yourself settling in for the evening with a good book or your loved one for some good conversation. I'd love to see your bar cart when you spruce yours up! Tag me on instagram @hboutofthestudio or twitter @hannahbetzel and say hello!